Geary Garners 2 Eisners noms! 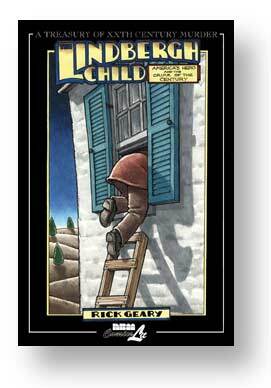 Congratulations go to Rick Geary, our author of the always superb Treasury of Murder, whether Victorian or XXth century, for his nominations in the Eisners as best writer/artist and for The Lindbergh Child as Best Reality Based Work! If you’re a pro getting a ballot, make sure you vote for this still somewhat under-rated artist (although I have to say he keeps growing in awareness out there) with such a personal style. Lindbergh, by the way, along with his next Famous Players book, out in June about a famous murder in the early already scandalous days of Hollywood, are Junior Library Guild selections. Print runs on these are now surpassing 10,000.